This past week has been quiet on the water, seen a few boats out sturgeon fishing but overall most people have put the sturgeon rods away until water temperatures begin to warm in early Spring. There are three active fisheries in the Vancouver region to consider during winter, the first and most popular is steelhead fishing, second would be the winter trout fishery on the Fraser and Harrison and last but not least fishing Vancouver area for winter springs. Vedder River Steelhead – The Vedder river is in great shape, the boxing day derby produced some nice fish so we should see a decent run of fish this year. Water levels are low and clear and with expected cold/clear forecast for the next few days I would expect the Vedder to drop even further. January is a big month for the Vedder as we start to see consistent pushes of steelhead migrating through the lower river, best bet is to reduce your gear size and offering, lighten your leader and try fishing the faster water that has good cover. As long as water levels stay low and clear you will need to make a few adjustments, try split shot instead of pencil lead, try single egg or small wool ties, use small roe bags instead of big chunks of bait, reduce your leader to 8-10lb test for more hook ups. Chehalis River – The Chehalis River is low and clear, drove over it yesterday and wow is it low. I prefer fishing the canyon or anywhere you can find some deeper water in these conditions. This river foes not get the big run of steelhead like the Vedder but it can produce some nice fish. There are still some Coho around and lots of cutties in the main channel and lower canyon. Harrison River – Like all local rivers the Harrison is also low and clear but that is pretty normal for this river in winter. We are hearing some good reports of Cutthroat fishing on the fly but the best is yet to come. This river is best fished in late winter early spring for cutts but also holding steelhead that are heading up the Chehalis River. Try fishing above Harrison Rapids along the west side between pilons and native boat launch. 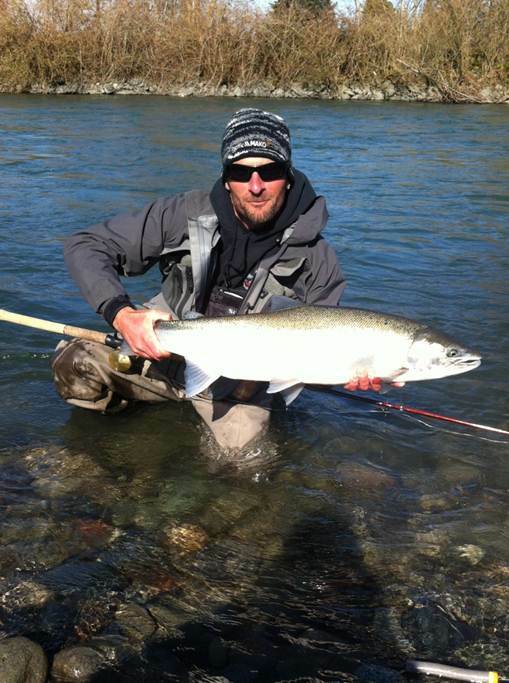 Fraser River – is in great shape for trout fishing, water is clear with 3 to 4 feet of visibility. The Fraser is best fished for trout between Chilliwack and Hope, lots of great gravel bars to fish and some good back eddies as well. Sturgeon fishing is pretty much over for the winter but we will probably do a few trips looking to tag some juvenile sturgeons. Most sturgeon are lethargic in winter but some areas still have feeding sturgeon like Stave and even Harrison River. Vancouver Ocean – we are getting a few reports of some winter Chinook being caught in Vancouver Harbour. This winter fishery can be very good but mostly hit and miss fishery. Crab fishing has been good so all in all it is a great day spent on the water if weather is good. Our ocean boat is home for a few repairs and we are expecting to put it back in the water in early February. If you would like to do a winter salmon trip, give us a call. 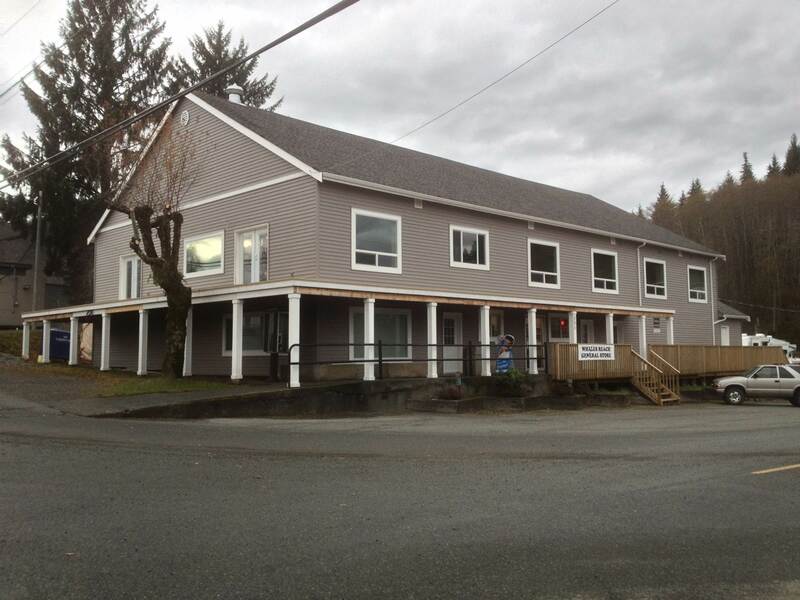 Whales Reach Lodge is a new 8 bedroom lodge located in Coal Harbour just 17km west of Port Hardy. This quiet native community is the gateway to some of the best salmon and halibut fishing on the west coast. The calm waters between Coal Harbour & Winter Harbour offer our guests world class fishing in the protected waters of Quatsino Sound. Chinook, Coho, Sockeye, Halibut, Black Bass, Cod, Snapper, Crab & Prawns are all abundant in these waters. Our 4 day 3 night package is just enough time to fill the coolers with salmon and halibut for the year. Calm water fishing with opportunity to head out to sea for those like me who like to fish big west coast water. Trip details – All inclusive packages with 2 – 4 anglers per boat, 100% guided, all gear provided. Arrival day begins with meet & greet then head out onto the water for an afternoon salmon fish, returning for a crab feast by the fire. Day 2 & 3 are full days fishing for salmon and halibut followed by dinner and post fishing activities. Wrap up this incredible trip with a morning fish before heading home with your cooler full of salmon, halibut, snapper, cod, bass, crab and some prawns. Weekend and longer stays are available, maximum group size of 6 anglers per date. Combination package including Fraser Sturgeon are also available. Vancouver Harbour/Gulf Islands – early indications are showing much of the same results as we saw in 2012, winter and early spring fishery around Vancouver Harbour will produce Chinook Salmon between 4 to 12 lbs with the occassional salmon over 15lbs. The fishing is hit & miss but if you enjoy being on the water in one of the most beautiful cities in the world, it is worth a try. The crab and prawn fishing was excellent all through last winter and spring so I would expect much the same for this season. Still to early to predict summer fishery but your best bet after the May / June Gulf Island Chinook fishery is to head over to west coast of Vancouver Island. Fraser River – Salmon forecast for 2013 are not available at this time, preliminary trends would indicate the early Fraser Chinook runs are still low in abundance. The 4.2 & 5.2 stocks are salmon that enter the river between April & July are still well under escapement goals so for the time being my guess is that the Fraser will not open for salmon fishing until mid July, or similar to 2012. TheSockeye run is expected to be similar to 2012 with 2 to 3 million fish returning. 2013 is a Pink Year with an average of 10 to 20 million pink salmon returning between late August & end of September. This is a great fishery for all anges and abilities including fly fishing. We book up fast for this fishery so book early. Fall Chinook & Coho returns have been good to excellent over the past few years and this past season we had a record return of Chum Salmon reaching over 2.5 million fish. Vancouver Island West Coast – early season predictions are much like last year which is good news. May through June was good in the lower region of island (Victoria, Ucuelet, Nootdka) with mid and north coast producing best results July through to late August (Kyuquot, Winter Harbor, Quatsino, Coal Habour). We did well fishing on both east side and West Coast Island, Coal & Winter Harbour was on fire in July and August. Telegraph Cove, Port McNeil & Port Hardy really got going in mid August and was fishing best until early September. Check out our new lodge package for West Coast Coal Harbor, come fish with Thomas,Vic & Grant this July & August.